Halmstad, a city where dreams will be realised and hearts will be broken as the Liebherr 2018 World Team Table Tennis Championships officially opens on Sunday 29th April. one team heading to Sweden with great ambitions and maybe something to prove in the Women’s Championship Division is Chinese Taipei. Runner up at the 2016 edition of the Women’s World Cup and bronze medallist at the same event one year later Cheng I-Ching unsurprisingly makes the squad selection for the trip to Halmstad and is joined by Chen Szu-Yu, a player who is more than capable of mixing it with the world’s elite athletes. Showing significant progress in the last year, Cheng Hsien-Tzu has established herself as a permanent fixture in the Chinese Taipei team and will be hoping to fully demonstrate her talent over the course of the next week when she takes to the biggest stage. The two remaining team spots have been awarded to Liu Hsing-Yin and Lin Chia-Hui. If the campaign two years back at the 2016 World Team Championships is anything to go by then there are reasons for Chinese Taipei to feel confident for the upcoming tournament; the team secured a 3-2 win over Hong Kong in the last eight of the 2016 event in Kuala Lumpur, Malaysia to secure a bronze medal finish for the first time. However, since then it has been somewhat of a struggle for Chinese Taipei in team competitions with earlier than anticipated exits at the 2016 Olympic Games, Seamaster 2017 ITTF Asian Championships and the 2018 ITTF Team World Cup but they will be hoping to fare much better in Halmstad, especially with Cheng I-Ching and Chen Szu-Yu at the forefront of the line-up. Named as the third seeds the expectation will be to see Chinese Taipei involved in the latter stages of the competition – can they live up to the success of their previous World Team Championships outing and achieve another podium finish? 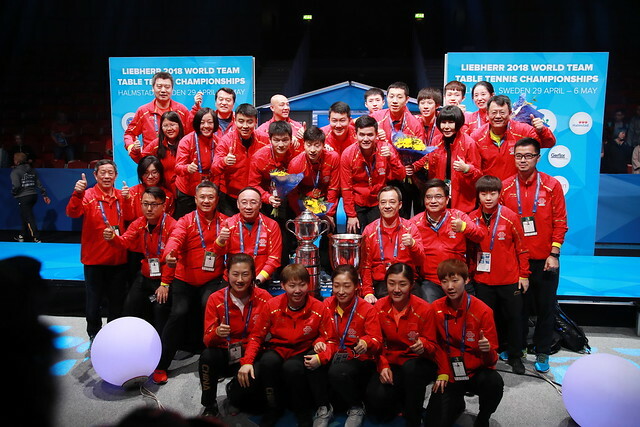 Book your tickets for the Liebherr 2018 World Team Table Tennis Championships here to see how far Chinese Taipei can go in Sweden.